Jan Bacur was born in 1937 in Padina, Serbia. He worked as a registrar and retired in 1993. In 1950, at the age of 13, he participated in a group exhibition in Padina, Serbia. 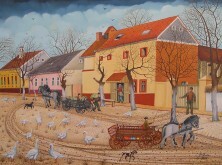 In 1962 he became a member of the Kovacica Naïve Art Gallery, Kovacica, Serbia.